Golpira, H., Zandieh, M., Najafi, E., Sadi Nezhade, S. (2015). Coordination of green supply chain network, considering uncertain demand and stochastic CO2 emission level. Journal of Industrial Engineering and Management Studies, 2(2), 43-54. H. Golpira; M. Zandieh; E. Najafi; S. Sadi Nezhade. "Coordination of green supply chain network, considering uncertain demand and stochastic CO2 emission level". 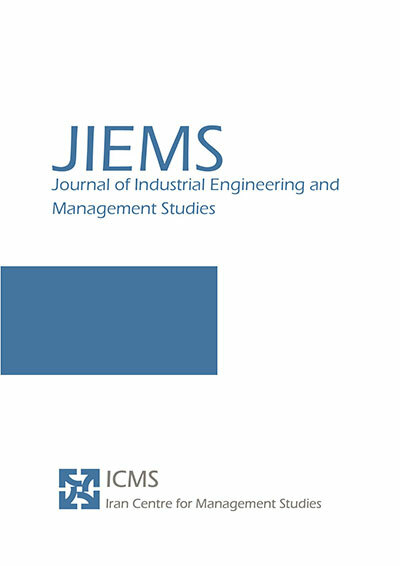 Journal of Industrial Engineering and Management Studies, 2, 2, 2015, 43-54. Golpira, H., Zandieh, M., Najafi, E., Sadi Nezhade, S. (2015). 'Coordination of green supply chain network, considering uncertain demand and stochastic CO2 emission level', Journal of Industrial Engineering and Management Studies, 2(2), pp. 43-54. Golpira, H., Zandieh, M., Najafi, E., Sadi Nezhade, S. Coordination of green supply chain network, considering uncertain demand and stochastic CO2 emission level. Journal of Industrial Engineering and Management Studies, 2015; 2(2): 43-54. 1Department of industrial engineering, Sanandaj branch, Islamic Azad University, Kurdistan, Iran. 3Department of Industrial Engineering, Science and Research Branch, Islamic Azad University, Tehran, Iran. 4Department of Statistics and Actuarial Science, University of Waterloo, Ontario, Canada. Many supply chain problems involve optimization of various conflicting objectives. This paper formulates a green supply chain network throughout a two-stage mixed integer linear problem with uncertain demand and stochastic environmental respects level. The first objective function of the proposed model considers minimization of supply chain costs while the second objective function minimizes CO2 emission level. The Conditional Value at Risk (CVaR) approach is used to deal with the demand uncertainty in supply chain network in addition to the scenario based approach that is employed to deal with the stochastic level of CO2 emission. The implementation of the proposed model has been demonstrated using some randomly selected numbers and the results are analyzed accordingly. Ahn, Y. C., Lee, I. B., Lee, K. H., & Han, J. H., 2015, “Strategic planning design of microalgae biomass-to-biodiesel supply chain network: Multi-period deterministic model”, Applied Energy, 154, 528-542. Baghalian, A., Rezapour, S., & Farahani, R. Z., 2013, “Robust supply chain network design with service level against disruptions and demand uncertainties: A real-life case”, European Journal of Operational Research, 227(1), 199-215. Bertsimas, D., & Brown, D. B., 2009, “Constructing uncertainty sets for robust linear optimization”, Operations research, 57(6), 1483-1495. Bouzembrak, Y., Allaoui, H., Goncalves, G., & Bouchriha, H., 2011, “A multi-objective green supply chain network design”, In Logistics (LOGISTIQUA), 2011 4th International Conference on (pp. 357-361). IEEE. Brandenburg, M., Govindan, K., Sarkis, J., & Seuring, S., 2014, “Quantitative models for sustainable supply chain management: Developments and directions”, European Journal of Operational Research, 233(2), 299-312. Chibeles-Martins, N., Pinto-Varela, T., Barbosa-Póvoa, A. P., & Novais, A. Q., 2016, “A multi-objective meta-heuristic approach for the design and planning of green supply chains-MBSA”, Expert Systems with Applications, 47, 71-84. Coskun, S., Ozgur, L., Polat, O., & Gungor, A., 2015, “A model proposal for green supply chain network design based on consumer segmentation”, Journal of Cleaner Production. Devika, K., Jafarian, A., & Nourbakhsh, V., 2014, “Designing a sustainable closed-loop supply chain network based on triple bottom line approach: A comparison of metaheuristics hybridization techniques”, European Journal of Operational Research, 235(3), 594-615. Dotoli, M., Epicoco, N., & Falagario, M., 2015, “A Technique for Supply Chain Network Design under Uncertainty using Cross-Efficiency Fuzzy Data Envelopment Analysis”, IFAC-PapersOnLine, 48(3), 634-639. Elbounjimi, M., Abdulnour, G., & Ait-KadiI, D., 2014, “Green Closed-loop Supply Chain Network Design: A Literature Review”, International Journal of Operations and Logistics Management, 3(4), 275-286. Elhedhli, S., & Merrick, R., 2012, “Green supply chain network design to reduce carbon emissions”, Transportation Research Part D: Transport and Environment, 17(5), 370-379. Eskandarpour, M., Dejax, P., Miemczyk, J., & Péton, O., 2015, “Sustainable supply chain network design: An optimization-oriented review”, Omega, 54, 11-32. Feng, Z., Wang, Z., & Chen, Y., 2014, “The equilibrium of closed-loop supply chain supernetwork with time-dependent parameters”, Transportation Research Part E: Logistics and Transportation Review, 64, 1-11. Garg, K., Kannan, D., Diabat, A., & Jha, P. C., 2015, “A multi-criteria optimization approach to manage environmental issues in closed loop supply chain network design”, Journal of Cleaner Production, 100, 297-314. Golpîra, H., Zandieh, M., Najafi, E., Sadi-Nezhad, S., 2016, “A multi-objective, multi-echelon green supply chain network design problem with risk-averse retailers in an uncertain environment”, Scientia Iranica. Govindan, K., Jafarian, A., & Nourbakhsh, V., 2015, “Bi-objective integrating sustainable order allocation and sustainable supply chain network strategic design with stochastic demand using a novel robust hybrid multi-objective metaheuristic”, Computers & Operations Research. Gui-tao, Z., Hao, S., & Jin-song, H., 2014, “Research on supply chain network equilibrium problem with multi-type suppliers”, In Service Systems and Service Management (ICSSSM), 2014 11th International Conference on (pp. 1-5). IEEE. Guillén‐Gosálbez, G., & Grossmann, I. E., 2009, “Optimal design and planning of sustainable chemical supply chains under uncertainty”, AIChE Journal, 55(1), 99-121. Gunasekaran, A., Subramanian, N., & Rahman, S., 2015, “Green supply chain collaboration and incentives: Current trends and future directions”, Transportation Research Part E: Logistics and Transportation Review, 74, 1-10. Jamshidi, R, Fatemi Ghomi, SMT, & Karimi, B., 2012, “Multi-objective green supply chain optimization with a new hybrid memetic algorithm using the Taguchi method”, Scientia Iranica, 19(6), 1876-1886. Kagawa, S., Suh, S., Hubacek, K., Wiedmann, T., Nansai, K., & Minx, J., 2015, “Co2 emission clusters within global supply chain networks: Implications for climate change mitigation”, Global Environmental Change. Kannegiesser, M., Günther, H. O., & Autenrieb, N., 2015, “The time-to-sustainability optimization strategy for sustainable supply network design”, Journal of Cleaner Production, 108, 451-463. Kawasaki, T., Yamada, T., Itsubo, N., & Inoue, M., 2015, “Multi Criteria Simulation Model for Lead Times, Costs and Co2 Emissions in a Low-carbon Supply Chain Network”, Procedia CIRP, 26, 329-334. Li, B., Chen, P., Li, Q., & Wang, W., 2014, “Dual-channel supply chain pricing decisions with a risk-averse retailer”, International Journal of Production Research, 52(23), 7132-7147. Mallidis, I., Vlachos, D., Iakovou, E., & Dekker, R., 2014, “Design and planning for green global supply chains under periodic review replenishment policies”, Transportation Research Part E: Logistics and Transportation Review, 72, 210-235. Martí, J. M. C., Tancrez, J. S., & Seifert, R. W., 2015, “Carbon footprint and responsiveness trade-offs in supply chain network design”, International Journal of Production Economics, 166, 129-142. Miret, C., Chazara, P., Montastruc, L., Negny, S., & Domenech, S., 2016, “Design of bioethanol green supply chain: Comparison between first and second generation biomass concerning economic, environmental and social criteria”, Computers & Chemical Engineering, 85, 16-35. Mirzapour Al-e-hashem, S. M. J., Baboli, A., & Sazvar, Z., 2013, “A stochastic aggregate production planning model in a green supply chain: Considering flexible lead times, nonlinear purchase and shortage cost functions”, European Journal of Operational Research, 230(1), 26-41. Mulvey JM, Vanderbei RJ, Zenios SA, 1995, “Robust optimization of large-scale systems”, Operations research 43, 264-281. Nakamichi, K., Hanaoka, S., & Kawahara, Y., 2016, “Estimation of cost and Co2 emissions with a sustainable cross-border supply chain in the automobile industry: A case study of Thailand and neighboring countries”, Transportation Research Part D: Transport and Environment. Natarajan, K., Pachamanova, D., & Sim, M., 2009, “Constructing risk measures from uncertainty sets”, Operations Research, 57(5), 1129-1141. Nouira, I., Hammami, R., Frein, Y., & Temponi, C., 2016, “Design of forward supply chains: Impact of a carbon emissions-sensitive demand”, International Journal of Production Economics, 173, 80-98. Rezaee, A., Dehghanian, F., Fahimnia, B., & Beamon, B., 2015, “Green supply chain network design with stochastic demand and carbon price”, Annals of Operations Research, 1-23. Sarkis, J., 2012, “A boundaries and flows perspective of green supply chain management”, Supply Chain Management: An International Journal, 17(2), 202-216. Seuring, S., 2013, “A review of modeling approaches for sustainable supply chain management”, Decision support systems, 54(4), 1513-1520. Sharifzadeh, M., Garcia, M. C., & Shah, N., 2015, “Supply chain network design and operation: Systematic decision-making for centralized, distributed, and mobile biofuel production using mixed integer linear programming (MILP) under uncertainty”, Biomass and Bioenergy, 81, 401-414. Sitek, P., & Wikarek, J., 2012, “Cost optimization of supply chain with multimodal transport”, In Computer Science and Information Systems (FedCSIS), 2012 Federated Conference on (pp. 1111-1118). IEEE. Soleimani, H., & Kannan, G., 2015, “A hybrid particle swarm optimization and genetic algorithm for closed-loop supply chain network design in large-scale networks”, Applied Mathematical Modelling, 39(14), 3990-4012. Varsei, M., Soosay, C., Fahimnia, B., & Sarkis, J., 2014, “Framing sustainability performance of supply chains with multidimensional indicators”, Supply Chain Management: An International Journal, 19(3), 242-257. Talaei, M., Moghaddam, B. F., Pishvaee, M. S., Bozorgi-Amiri, A., & Gholamnejad, S., 2015, “A robust fuzzy optimization model for carbon-efficient closed-loop supply chain network design problem: a numerical illustration in electronics industry”, Journal of Cleaner Production. Urata, T., Yamada, T., Itsubo, N., & Inoue, M., 2015, “Modeling and Balancing for Costs and CO 2 Emissions in Global Supply Chain Network among Asian Countries”, Procedia CIRP, 26, 664-669. Wang, F., Lai, X., & Shi, N., 2011, “A multi-objective optimization for green supply chain network design”, Decision Support Systems, 51(2), 262-269. Wu, K. J., Liao, C. J., Tseng, M. L., & Chiu, A. S., 2015, “Exploring decisive factors in green supply chain practices under uncertainty”, International Journal of Production Economics, 159, 147-157.